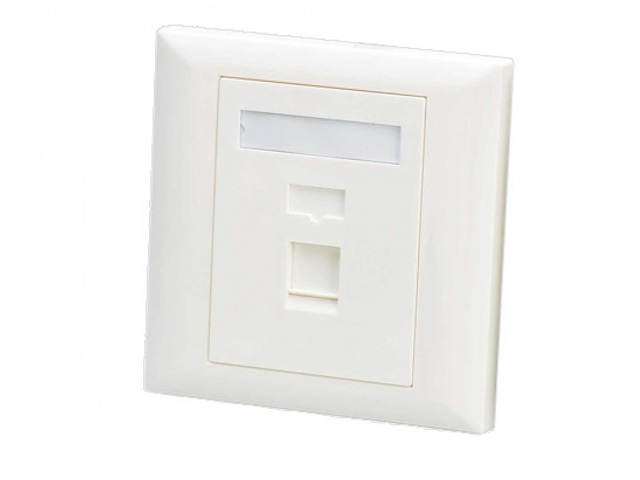 The wall plate is made from high-impact ABS plastic,making for years of durable use. Each delivers high speed of for all your high-speed applications to the desktop. Perfectly blends into the decor of your home or office. Protects and hides your network connections. Accepts all keystone inserts, standard 110 type IDC termination makes installation fast and easy. Suitable for various modules and multimedia interfaces,Radian appearance make it more slinky,Embedded chart and logo position make it easy to identity,With position of inserted graph and label for convenient distinction. Size (mm):L x W, 86 x 86. The performance of anti-burn: anti-burn PC plastic parts. Material:PC,Combustibility achieved GB/T 5169.7-1985 standard. Standard: according to the international standard ISO9001,RoHS, UL, CE. Specification: 1-port, 2-port, 3-port and multi-port. For installing modular jacks such as RJ45, Cat5e, Cat6. Competetive price at same quality level. Good quality: all of terms have ISO9001/ RoHS/ UL/ CE certification. Fast delivery- Cooperation with Top livery companies around the world. Flexibility: Prompt reaction to urgent order and samples.